EDIT: Grab yourself designer shoes for less at Luisa Via Roma! As most women even I am a shoe lover. Of course I do love bags but recently I have discovered that when I invest in a pair of shoes I wear them over and over again. They have that power of transferring any outfit within a second and they simply create a smile on my face. However not everybody has got big enough budget to buy three pair of designer shoes a month so it is always good to wait for sales and different offers to grab that dream pair. I do often wait myself for sales or events like Black Friday as I know it makes a huge difference in highly priced designer items to get few percent off. One of my favourite online shops to buy from is definitely Luisa Via Roma. I also visited their store in Florence which is a must see shopping spot there. 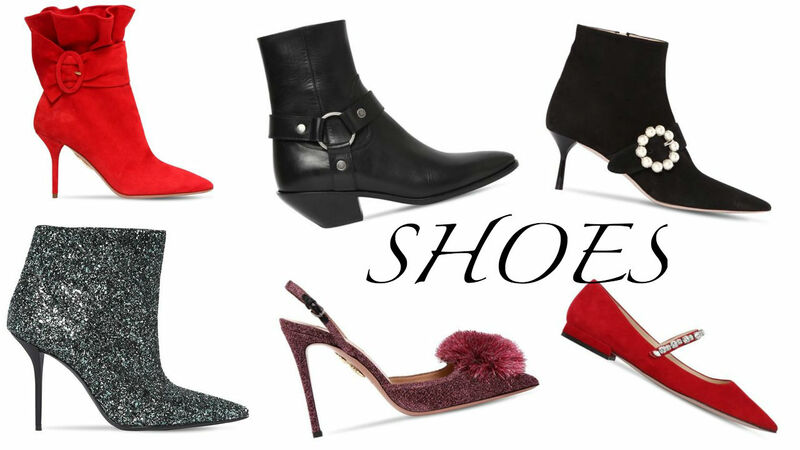 And pretty much as every year Luisa Via Roma will have Black Friday offers so I wanted to create a gorgeous shoes edit as you can start to decide what lush item you will be adding to your closet. However if you feel like waiting for Black Friday is not for you…you can still shop 15 % cheaper items (the star items excluded) if you download Luisa Via Roma app. Jako vetsina zen i ja jsem milovnice botu. To vite, ze mam rada i kabelky, ale nejak jsem zjistila, ze kdyz opravdu investuju do drazsich botu, ze je nosim porad dokola a ta investice se vyplati. A navic boty dokazou zmenit styling behem vteriny. Jenomze ne kazdy ma rozpocet si koupit troje designerske boty do mesice a tak nekdo z nas musi setrit ci pockat na slevy. Ted je pred nama nejvetsi nakupni akce roku a to Black Friday a to je idealni doba na to poridit darky bud pro sebe nebo pro jine a treba si poridit vysneny par botu za mene. Ja osobne casto lovim na oblibenych designerskych e-shopech a jeden z mych top je urcite Luisa via Roma. Jako kazdy rok budou i letos poradat akce v ramci Black Friday a proto jsem se rozhodla vytvorit takovy shoe edit, ktery by vas snad mohl inspirovat. A navic pokud si stahnete aplikaci Luisa via roma, tak mate slevu 15 % na produkty, ktere nejsou oznaceny hvezdickou, takze vlastne ani nemusite cekat. Whether you are looking for chic flats or interesting sandals for upcoming party season the selection is huge. I would say it is more problem to decide if you want trendy Balenciaga shoes or just classic pair of Jimmy Choos. Jestli uz chcete krasne nizke boty nebo zajimave sandalky, tak vyber je opravdu obrovsky. Je spise problem jestli chcete neco z trendujici Balenciaga kolekce nebo nadcasove modely od Jimmy Choo. For those who want to grab a pair of trainers as they are more sporty than glam there is enough to chose from. They have huge selection of “ugly” trainers models so hurry up. Pro ty, kteri jsou spise na sportovnejsi obuv je taky hodne na vyber, jestli uz chcete cenove dostupnou klasiku, ci treba neco z trendu jako “ugly” trainers. And there would not be a winter without a good and nice pair of boots. I am really loving their selection of Givenchy and Saint Laurent models and still keep dreaming of having them all. A nebyla by to ani poradna zima bez nejakych krasnych kozacek. At uz mate radi kotnickove ci nejaky skvely kousek nad kolena. Ja jsem zamilovana do vetsiny kousku od Saint Laurent a Givenchy. A tak dal snim, ze budou vsechny moje.